PaigeeWorld is now available! Includes all of the best content from ChibiDraw. Download now! PaigeeDraw has had huge success since its launch in December 2010 and is quickly becoming one of the most successful applications for people learning how to draw manga / anime characters. Many people find full characters difficult to start out with – ChibiDraw was developed to fill the void. Chibi Characters are not as complex as full manga characters, but they are often much more fun to draw! ChibiDraw shows you how to draw Chibis! Starting with the basics, ChibiDraw teaches you how to build your characters anatomies in different poses and positions. Once you have your characters pose, ChibiDraw then shows you how to sketch the characters, fineline, color and shade! Fashion is important so ChibiDraw has characters with several different hairstyles and clothing to help you learn to draw the latest fashions! 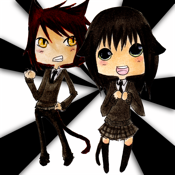 -Step by step drawing examples demonstrating how to draw chibis. Paige has provided several different styles of Chibis to practice with! Mini Chibis, Chibis and Tall Chibis! She has also created the “Chibi N3rds” bunch! - There are 38 full chibi tutorials including both girls and boys! More added with every update! -All you need is a pencil to sketch, an eraser if you make a mistake, a piece of paper and your imagination! If you want to be more advanced, all images are colored with Copic Markers. The Original PaigeeDraw was #1 on iTunes "New and Noteworthy" in education for almost 2 weeks. PaigeeDraw Free has been in the TOP 100 Free Education Applications on iTunes for months! Paige has been featured in the Vancouver Sun, The Financial Post, Global TV News, Breakfast Television and other news publications for PaigeeDraw. Paige is hoping for the same success with ChibiDraw! -Retina Display support for iPhone 4 and iPod Touch 4. -Full touch support, image zoom for greater detail, and simple swipe forward / back navigation. Buttons are also included for menu/section navigation. ChibiDraw currently has over 1300 pages of content! ChibiDraw is updated frequently providing additional drawing tutorials. The ChibiDraw web site is also available with tons of free Manga tutorials to teach you how to draw Manga online!